As mentioned above, driving the SWIFT gpi initiative is the UETR…. What is the UETR – Unique End-to-End Transaction Reference? Which Message Types Require the UETR – Unique End to End Transaction Reference? What are the UETR SWIFT Format Requirements? 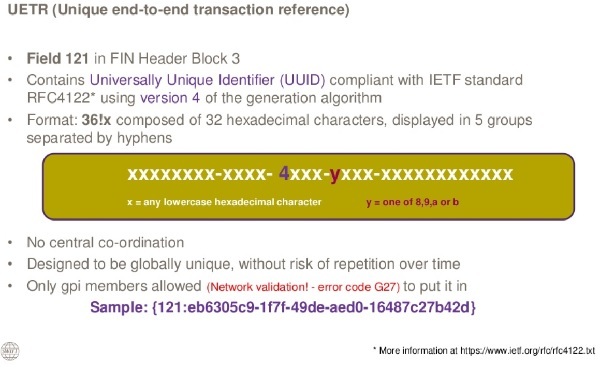 As stated above, the SWIFT Standard MT Release 2018 makes it mandatory for you to add the UETR in field 121 within block 3 of the FIN header. When SWIFT gpi is released to the broader corporate user base, you’ll indicate field 121 in your MT101 header in exactly the same way. Easy peasey, eh? What is the Service Type Identifier Field 111? Okay, I have a generated the UETR – What Next? The SWIFT Customer Security Programme EXPLAINED! I believe this article has incorrect information. Prior to MT standards 2018 it is not allowed to use the 111 and 121 tags if not part of the gpi Closed User Group (error code G27). What if as a intermediary bank i change the UETR value and payment get failed. If a bank creates a fresh payment UETR, it will be tracked as a new and a separate payment. The previous one will be continued to be shown as with this bank.